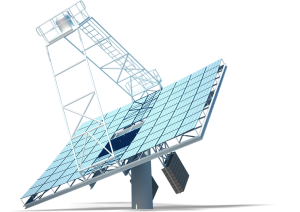 Clique Solar launches the ARUN®100 solar concentrator dish. ARUN®100 will retain the innovative dish design and the automatic two axis tracking system, while improving the economics. Solar water heating systems for bathing, washing, cleaning, pre-boiler applications etc. 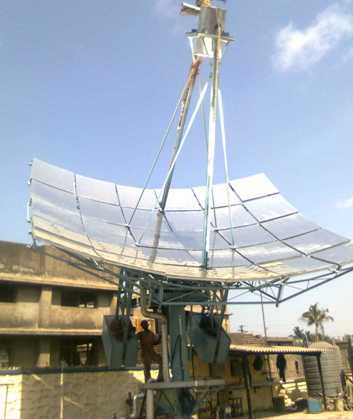 Solar steam generating systems for cooking, laundry, air conditioning etc. Installing a concentrated solar thermal (CST) system in hotels will not only reduce hotel’s operational costs, but it will also appeal to the environmentally conscious consumer of today’s market. Clique Solar is a pioneer in developing solar technology for industrial process heating and comfort cooling applications. Its patented ARUN® dish is a result of ground-breaking research and thorough testing. The Ministry of New and Renewable Energy (MNRE) and I.I.T. Bombay have supported this development effort. Industries such as Food Processing Industries (Dairy Industry, Sea Food Processing Industry, and Sugar Industry), Textile Processing Industry, Pharmaceutical Industry, Pulp & Paper Industry, Chemical Industry, Auto Component Industry etc. have large requirement of thermal energy in their manufacturing plants. Copyright © Clique Solar. All rights reserved.